Identification Tips: Tall plant which grows up 1.25 metres. The flowers are dense creamy clusters. Individual flowers are circa 2-5mm across. It has dark green leaves comprising 3 to 5 pairs of oval leaflets with smaller leaflets between. Look out for the white lacey heads in a wet field. 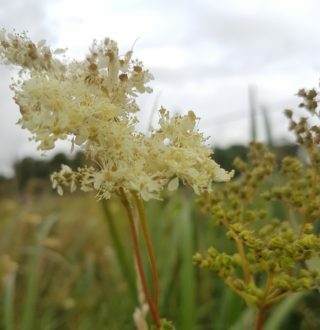 Meadowsweet favours damp areas and will often grow along by the banks of a river. It was traditionally brought inside to freshen the air. Its smell is heady and musky and is much stronger at night. I am told it was used to sweeten the hay of beds on which people use to lie. It was also used as a strewing herb. This means that it got mixed with the rushes on the floor. Rushes were commonly used to cover the muck floors of houses and castle. (Remember the story of St. Brigid who made the first St. Brigid’s Cross when she was visiting a sick king). We often forget that our ancestors didn’t haven’t the luxury of a mattress and covered floors like most of us have now! Meadowsweet contains large amounts of salicylic acid which is used today in aspirin as a pain killer. Some people have also used it as tea for indigestion, heart burn and ulcers. It has also been used as a dye in the past. I remember from my Junior Cert. science project, it produces a yellow colour. I was reading somewhere else that if you add in iron (rusty nail in a jar apparently works) to this dye you may get a lovely purple colour to develop! Worth trying sometime, I think. Meadowsweet flowers were once used to flavour mead , which is a fermented drink made from honey. In Celtic cultures, mead was believed to enhance virility and fertility, In fact, the term “honeymoon” is believed to have stemmed from the Irish tradition of newlyweds drinking honey wine every day for one full moon (a month) after their weddings. You will more likely find mead in a tourist shop rather than an off-licence. I do have it on good authority that they still serve it at the Medieval Banquet, in Dunguaire Castle, Kinvara, Co. Galway. This page was added on 14/03/2018.